The Hayle Harbour Advisory Committee, ING Real Estate Development UK (Hayle Harbour) Ltd, Hayle Harbour Authority Limited, the RSPB, Natural England, Environment Agency, Cornwall Council and Hayle Town Council have worked together to combine their different areas of expertise to produce the Hayle Estuary Management Plan. It draws partly on information within existing management plans (For example, RSPB Hayle Estuary Management Plan 2007-12) but aims to be wider-reaching, embracing all users. It is, nevertheless, concise and has been developed with a view towards practical application. The Hayle EMP draws together existing plans and helps clarify the roles, responsibilities and requirements of the statutory bodies, owners, occupiers and users of the estuary. It aims to promote joint working to deliver more effective outcomes through a co-ordinated and shared approach to management. The Hayle EMP does not attempt to override existing powers or responsibilities, or prescribe the outcomes of issues. Rather it is a non-statutory document, providing guidance and support for the integrated management of the Hayle Estuary as a healthy, natural environment enjoyed by residents and visitors alike. It is advisory, not statutory. This Dredging Protocol Document has been prepared by Buro Happold on behalf of Hayle Harbour Authority Limited (HHA) to record the historical activity of maintenance dredging within Hayle Harbour. 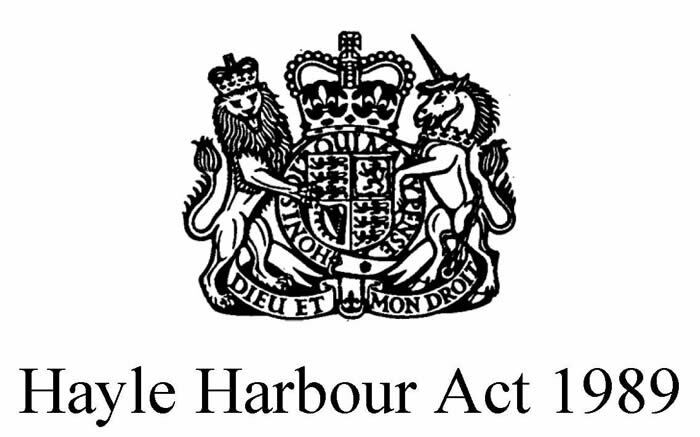 This Document has been provided in accordance with the requirements of clause 4.4 of the Licence to Dredge granted to Hayle Harbour Management Limited issued by Penwith District Council dated 7th May 2008 which has now expired. It therefore relates only to that licence and not to any future application to dredge that may be made by Hayle Harbour Authority Limited. It is recognised that all dredging has been suspended in Hayle Harbour until such time that a review into the methods available to keep the entrance channel open and for any future dredging requirements has been completed. Updated at the 20120118 meeting to incorporate an AGM and correct the names of attending organisations. This Dredging Protocol Document has been prepared by Buro Happold on behalf of Hayle Harbour Authority Limited (HHA) to record the historical activity of maintenance dredging within Hayle Harbour. This Document has been provided in accordance with the requirements of clause 4.4 of the Licence to Dredge granted to Hayle Harbour Management Limited issued by Penwith District Council dated 7th May 2008 which has now expired. It therefore relates only to that licence and not to any future application to dredge that may be made by Hayle Harbour Authority Limited. It is recognised that all dredging has been suspended in Hayle Harbour until such time that a review into the methods available to keep the entrance channel open and for any future dredging requirements has been completed. This Document has been prepared in accordance with the guidance given in Maintenance Dredging and The Habitats Regulations 1994, Conservation Assessment Protocol. It should be recognised that this has been requested to meet good practice and not as part of the Habitats Regulations through which Natural England would have a specific role in the establishment of this protocol. All environmental consultees are therefore expected to support and enhance this document with appropriate historical information and data. This Document includes consideration of dredging methods, volumes and frequencies of dredging, transport and disposal of dredged material, restrictions imposed on dredging, mitigation methods put in place, and the history of dredging in the given area. The maintenance dredging in Hayle Harbour doesn’t include the removal of the Cockle Bank or support any other harbour development or capital dredging need. It is required solely to ensure the safety of harbour users when navigating to and from the quays and out into St Ives Bay.